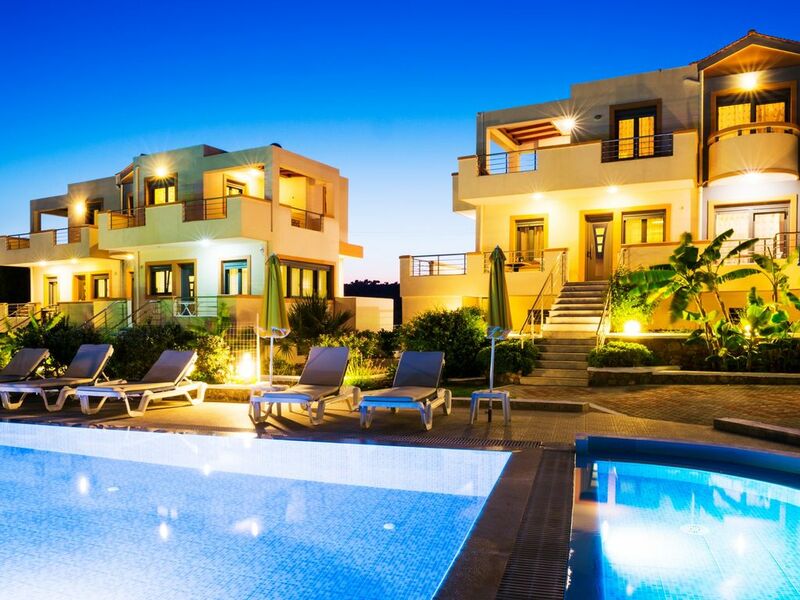 Every 2 villas for 7 people share one large swimming pool for adults and 1 swimming pool for children. Each villa for 7 people provides 3 separate bedrooms. 2 of the 3 bedrooms provide a double bed and 1 bedroom provides 2 single beds. There is also a sofa bed in the living room. A baby cot is available. It also provides a bathroom with bath or shower, a bathroom with Jacuzzi bath, living room with sofabed, kitchen with 4 electric rings, large refrigerator with ice maker, oven, microwave oven, toaster, kettle, coffeemaker and many kitchen utensiles. There is also table with chairs near the kitchen area, dishwasher, washing machine, safety deposit box, iron & iron board, satellite TVs and DVD player. All rooms have air-conditioning (Daikin). Each bedroom has bedside tables, wardrobe and hair dryer. Bed linen and towels are provided by us. One of the balconies provides outdoor shower. All rooms have access to a balcony with sea view. Finally, there are BBQ facilities at the garden area. Located in the middle of the eastern coast of the beautiful island of Rhodes, in the outskirts of Pefki resort are the newly built and luxuriously decorated Pefki Sea View Villas. With the nearest sandy beach being only a 2 minute walk (approximately 50 metres), all our properties feature stunning seaside views, from their numerous balconies and terraces. Constructed with their own swimming pools, BBQ's and many other facilities, among lavish gardens, our villas can surely provide the ideal accommodation choice for an unforgettable holiday. Mostly suited for: families, groups of friends/couples and even up to groups of families or wedding parties (capacity: 6/7 up to 28 persons total). Situated in an exclusive area, but in the close vicinity of must-see locations such as: the historic Lindos, the quiet village of Lardos or the popular Pefki resort, with activities nearby such as: watersports, mini-golf and go-karts, Pefki Sea View Villas are the optimal base for both a relaxed and an activity packed holiday. All modern facilities provided such as: free WiFi, Jacuzzi baths, smart flat screen tvs, dvd players, multiple air condition units, fully equipped kitchens etc. our villas will make you feel comfortable and relaxed in your home away from home. Wireless Internet Access: There is free wireless Internet access. Bring your laptop or your Phone/Tablet with you to enjoy free Internet. Summer Memories apartments are only 25 minutes (by car) far from the famous golf course of Rhodes island. In Pefkos beach there is a daily tour by glass boat from Pefkos beach to Lindos beach and back. Therefore, you can enjoy the beautiful coastline. In the bottom of the island there is a resort called Prasonisi, which is 38 kilometres (30 minutes by car)from Pefkos resort. Prasonisi is an ideal place for wind-surfers. Hundreds of them visit Prasonisi every year. In Lindos, apart from the Acropolis, you can visit the beautiful, romantic Saint Paul's bay (the scenery is fantastic). Thousands of couples have chosen to get married to Saint Paul's monastery. The villa provides 1 bathroom with bath or shower and 1 bathroom with Jacuzzi bath. There is also an outdoor shower at the balcony. Great accommodation in good area. Would recommend if you are not looking for a party town. Good location for getting around the island. Quiet but in walking distance of supermarkets, tavernas etc. A couple of minutes from quiet beach. Accommodation was fab. The outside area was great for lounging around during the day or evening with lush foliage and colourful lighting around the pool at night. We didn’t use the bbq and outside eating area but it looked really good. The owner was very helpful. I didn’t expect the villa to look like the photos but it did! We stayed in Pefkos seaview villas for 10 nights at the end of May 2012. We are a couple with two young children aged 5 and 2. We opted for the 3 bedroom villa with the swimming pools for adults and for children to share with the villa next door. We often go on holiday with Home away, but normally we choose among properties with reviews. This time we had no replies from owners with good reviews and decided to try this very attractive villa. Now we understand why there where no reviews. In fact the villas are brand new and we were among the first guests. We have been very pleased to find out that everything was in perfect order, all the appliances are top quality and the building itself has been done to very high standards. The villa is enough fro 6-7 persons so it was very large for us, but we just wanted plenty of room, and we certainly got it! The owners, Vassili and his wife, are extremely nice people and they will do whatever possible to satisfy every your single need! The swimming pool is very good and we did not have to share it with anyone for the first week, but even when you have to share there is plenty of room for everyone! We found that the location was also good, since the beach is only a few yards across the road and on the left there is a huge tree that provides shade and at the time there was nobody else on this sandy beach. On other occasions we have been to the main beach in Pefkos where there is a nice place for lunch (George Taverna) or to St Paul's bay in Lindos (very attractive even if crowded). The position of the villa is also very convenient for the restaurants in Lardos, in Lindos and in Pefkos. All in all it was an excellent holiday and we will surely be back! Velindrettet bolig til os 4 voksne og 2 børn. Området med swimming pools helt perfekt.Grill sted ok.
De 3 værelsers størrelser og placering tilgodeser privatliv i sammenhold med de 2 pæne badeværelser. Køkkenområdet sammen med opholdsområde med tv er funktionelt, men arealmæssigt noget snævert - man skal helst opholde sig udendørs, enten på diverse balkoner eller terrassen, alle steder med fin udsigt til omgivelsernes forholdsvis lave huse, hav og klipper. Et fredeligt område med nogen trafikstøj om dagen, men intet generende om natten. Pool området er helt i top - vandet er rent og omgivelserne ligeså med fin belysning om aftenen. Møbleringen er sparsom, men dækker behovet. Køkkenets hvidevarer fungerer fint. Når huset er aflåst, afbrydes elforsyningen (- ligesom på et hotelværelse), hvilket giver stop for opvaske- og vaskemaskinen når huset forlades. Køkkenudstyret virker mangelfuldt i stil med manglende udstyr ved grillen. Småting man selv kan rette - men lidt irriterende, når opholdet indledes, og man ikke spiser på nogle af de mange, nærliggende restauranter. Parkering indenfor en fjernstyret låge er perfekt, og hele området er lukket med hegn - beroligende med småbørn. Adgangen til stranden er ikke god - foranliggende bygninger lukker, men der er en smal, ikke så hygiejnisk sti, som fører ned til en ikke så børnevenlig strand. Kun 5 minutters kørsel til den meget fine og børnevenlige strand med P-plads ved Pefki kan anbefales. Oktober er sidst på sæsonen, og det bærer boligen lidt præg af. Vassili er en særdeles rar og venlig mand, som servicerede os alle til punkt og prikke. Boligen kan varmt anbefales, - man får meget for pengene! My family spent 10 days at Pefki Seaview Villa. It was fantastic! The villa is nicely located in a calm area with amazing open seaview. It is also at the foot of a stony hill. Wild goats came around dinner time almost every day. Lovely moments for the kids! Beaches are just cross the road. There are several restaurants close to the villa. Within walking distance, or by a short bus tour, you can reach Lardos village, or Pefki, where you can find more restaurants and supermarkets. Inside the villa area, there is a beautiful and clean pool. We spent a lot of lovely family moments at the pool. The villa is modern, functional and well equiped. The owner Vassilis is very friendly, nice and helpful. The kids love him. Vassilis is also a talented gardener. The garden is beautiful with a lot of flowers. Many, many more nice things about Pefiki Seaview Villa... We will definitely come back, as well as strongly recommend you to choose the villa when you go to Rhodos!!! Wir waren 2 Wochen in Rhodos und haben in Pekfi gewohnt. Die Lage ist klasse, mann kann zu Fuss zum Strand. Wir haben uns ein Auto gemietet und haben so die Insel erkundigt. Abends haben wir dann die Aussicht auf der Terasse genossen und die Kinder das Schwimmbad. Wir koennen es nur empfehlen. Wir hatten tolle 2 Wochen. Die Vermieter sind super und waren immer da, um zu schauen ob alles i.o. war. Pefki Sea View Villas are located just outside Pefki (or Pefkos) resort, 1 km from Lardos village and 3 km from Lindos village. Just 50 metres from the villas there are supermarkets, restaurants and car rentals. There is bus stop just outside the villas. Pefki (or Pefkos) is one of the most famous tourist resorts of the island of Rhodes. It is famous for its sandy beaches, the calm sea and the restaurants (which serve very good food). Lindos is one of the main destinations of the island. Lindos is famous for its Acropolis with the castle of the Knights, the traditional architecture of the houses, the narrow alleys, the beautiful sandy beach and the night-life. Saint Paul's bay, famous for the weddings which take place, is only 3 km from the villa. Lardos is a traditional village which also attracts many tourists. It is famous for its restaurants, bars and Greek nights. Note: All the facilities of the villa are included in the above price. All applicable taxes are included. The rates that are indicated above are for a villa for up to 7 people. For more information please contact us. The earliest check-in on the arrival day is at 16:00. The latest check-out time on the departure day is at 11:00am.